More than 2,000 people are now taking part in the Sheffield City Region's (SCR) Working Win health-led research trial. The aim of the trial is to assess the best type of support for those who are out of work, or struggling in their current job, due to a physical or mental health condition. The innovative research trial, one of only two such projects in the UK, has also been credited in the NHS' Long-Term Plan, launched earlier this month. Being a randomised control trial, it means that people who take part will be randomly placed into one of two research groups. One group will receive the service and the other group will be provided with detailed information about existing services in their area. It will test out how effective a new type of holistic support is for people who could stay in work, or get a job, if they just had the right sort of support for physical or mental problems. Dan Jarvis, mayor of the Barnsley, Doncaster, Rotherham and Sheffield Combined Authority, said: "It's a great achievement to have reached this point in the Working Win trial. I'm very grateful to the 2,000 people who are giving their time for this important research, which simply couldn't take place without them. "I hope that this trial, together with the NHS' commitment to focus on health and employment as part of their Long Term Plan, means that, nationally, we can find better solutions for people who want to work, but have so far been restricted by mental or physical health conditions. "I'm also proud that Sheffield City Region is leading the way by pioneering this new kind of employment support. It's great to see that people in our region are the first to trial this innovative scheme, which is already making a difference to so many lives." Des Breen, Medical Director for the South Yorkshire and Bassetlaw Integrated Care System, added: "We know that one of the determinates for good mental and physical health is stable employment. “The integrated care approach looks at all things which can contribute to a person becoming ill. The NHS Long Term Plan published earlier this month sets out a commitment to integrated care where, housing, education, employment and medical care are all looked at as a whole in order to tackle the underlying causes of ill health." 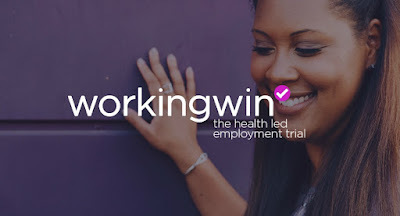 The Working Win trial is being delivered locally in partnership with South Yorkshire Housing Association, which has a wealth of experience in running employment support programmes. Niall O'Reilly, Head of Work and Wellbeing of South Yorkshire Housing Association, said: "We're incredibly grateful to the 2,000 people across South Yorkshire and Bassetlaw who've signed up to Working Win. "They're helping us test an innovative new way of supporting people with health conditions to find and sustain good work, an approach that's compassionate, strengths-based and entirely voluntary. "The feedback we've already received from participants is really encouraging. More than 90% of people describe our service as Good or Excellent. "There's still an opportunity for 5,500 more people to take part."